“In 80 minutes around the world” is a musical journey during which we will visit the most magical corners of the world and our path will be filled with the greatest international hits. Whole article you can read here: TUTAJ (Polish only). 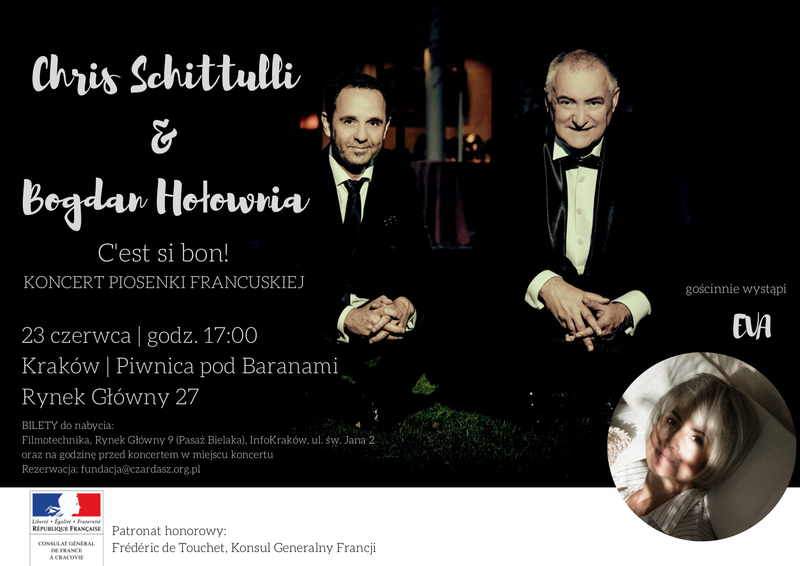 Eva will perform at the concert of a French song by Chris Schittulla and Bogdan Hołownia. The performance will take place on June 23, 2018 at 5:00 pm at Piwnica pod Baranami in Krakow. The event was under the honorary patronage of Frédéric de Touchet, Consul General of France. The preview of the video for the first single Eva, “Szafirowy blask”, has been circulating for a long time on the web, and the fans of the artist categorically demanded the whole of the clip. That is why on October 23 Teleexpress premiered the long awaited music video for the song, which is a cover of the French soundtrack for the movie “Maria Skłodowska-Curie”. Experience an amazing journey in time and see all available material. Traveller and artist. Eva is a graduate of higher music studies. She is a singer with a characteristic, rhythmic, pop repertoire with warm, easy-going lyrics and colourful stage stylizations. She has performed in many countries around the world.